Apparently the MPAA doesn’t consider baby oil “adult material,” because the ratings board has bestowed The Expendables 3 with a PG-13 rating for “violence including intense sustained gun battles and fight scenes, and for language.” The first two Expendables movies were both rated R for “strong action and bloody violence” and “strong bloody violence,” respectively—which suggests that, this time, the bad guys won’t bleed after being mowed down by machine guns. Usually a PG-13 rating translates into increased revenue at the box office, especially for a big summer movie like The Expendables 3. 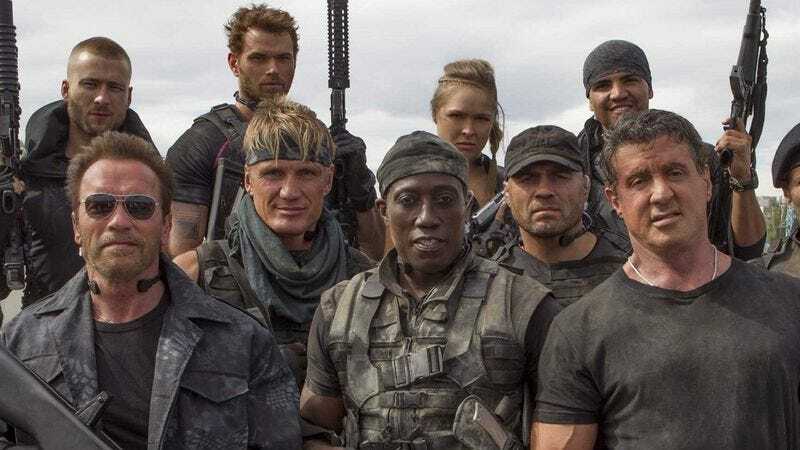 But considering that the Expendables franchise has been built on hard-R fan service—and the fact that no one under 17 knows who Dolph Lundgren is—a crowd-friendly PG-13 might not be the magic money machine that someone on this production seems to think it will be. Still, they did get Kellan Lutz for this one, so we’ll see.